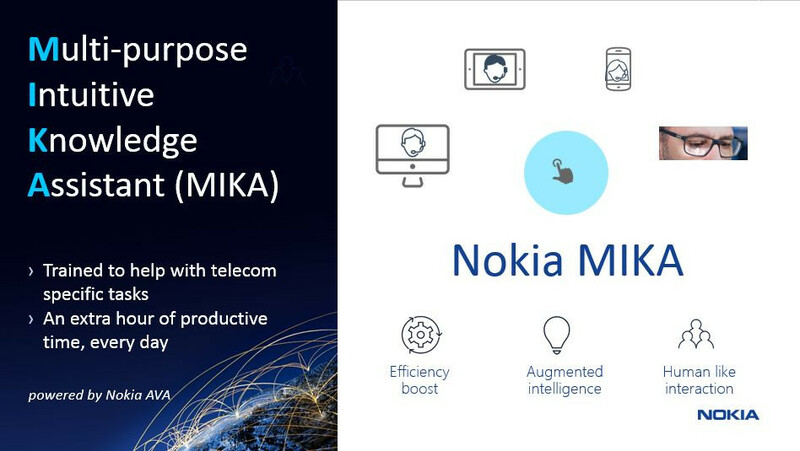 Nokia has launched MIKA a Multi-purpose Intuitive Knowledge Assistant’ which is a customized ‘digital assistant’ that will help to improve telecom operators’ efficiency by providing engineers faster access to critical information. Powered by the Nokia AVA cognitive services platform and underpinned by Nokia’s services expertise, it will provide voice-dictated automated assistance to reduce time spent searching information resources, enabling operators to focus on key business tasks without being distracted by the complexities of multi-technology network environments. Nokia said that it is the first digital assistant ‘trained’ specifically for the telecom industry, designed to provide automated assistance that saves time and frees highly skilled workers to focus on critical tasks. 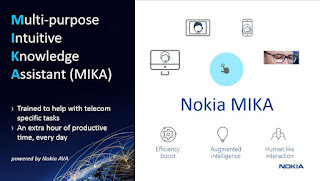 Nokia also said that its analysis of working methods within a Network Operations Center has revealed that application of MIKA could ‘give back’ more than one hour of productive time every day to engineers by providing them with access to information and recommendations through the interactive user interface.MIKA combines augmented intelligence with automated learning to provide access to an extensive range of tools, documents and data sources. These include the Nokia AVA knowledge library, a repository of best practice gathered from Nokia projects around the world. Nokia also introduced Predictive Repair, the first service of its type in the telecommunications industry. It draws on Nokia’s deep hardware services expertise – correlating network, repair center and factory data. The service is available to operators that use Nokia 3G and 4G equipment. Nokia MIKA Digital Assistant as a Service is now available for customer trials, and will be demonstrated at the Nokia booth at Mobile World Congress 2017 in Barcelona between February 27 and March 2. Nokia Predictive Repair will be available for customer trials in March 2017.